New Supra committee of 5 named 4 Major General 4 Arrested 4 assigned to House Arrest!!! 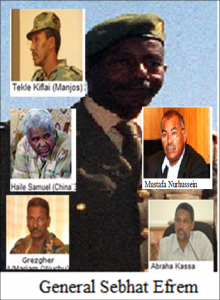 Following the 21 January, 2013 army mutinies that occupied Ministry of Information, on the 28th February, 2013 the Eritrean regime named a new Supra Body composed of 5 Brigadier Generals with full & unlimited power. The New body is running the country right now and putting people in prison in mass those suspect of supporting the mutineers. The only person above the new Supra Committee is the figure head Isasias Afwerki. Hundreds of Colonels are arrested others are under house arrest the rest are fleeing the country. The mountaineers are said to be barricaded in Adi Keyih stronghold in central plateau led by Col. Osman Salah. Previously Eritrea was run de facto by 5 Operation areas as we have mentioned in our previous information, but today since most of the 1st and the 5th operation area’s soldiers run away to Sudan and Ethiopia due to shortage food, prolonged services and luck of freedom only three are left . These three with a new labeling called EZ or Command are running the country from the west, south and East regions of Eritrea. The country is still without a state apparatus and everything is run as it was in 1991 when EPLF’ liberated Eritrea. Due to the fear of muteness joining Ethiopian camp Eritrean government is forced to start Peace Negotiation with Ethiopia recently. Moreover, all opposition Ethiopian Armed group has been removed from border areas and taken to Alphabet camps and arrested as a precondition to negotiation with Ethiopia. On the 21st of February the following officials were arrested. Abdella Jaber the Director of Organizational Affairs for the ruling party, the PFDJ and member of CC. Amanuel “Hanjema” Haile the political commissar Division 96 in the Southern Red Sea. Osman Jem’ee Idris , Eritrea’s ambassador to the United Arab Emirates. © 2013, Prof. Muse Tegegne. All rights reserved.